As everyone knows, our kids need to get outside and exercise more. Michelle Obama's Let’s Move campaign states that kids need to engage in an hour of physical activity a day to grow up healthy. And there’s another aspect to exercise that’s important to consider. Former US Surgeon General David Satcher observes that “children who are more physically fit do better academically.” Better grades are another good reason for moms to get kids to exercise. It can be difficult to get kids to go exercise, but they all want to have fun. 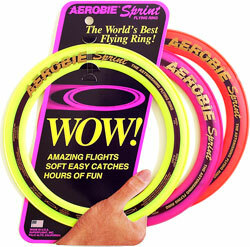 The spectacular Aerobie Sprint flying rings that can turn an hour of exercise into an hour of fun for any group of kids. That hour of fun can spread into a family activity that gets everybody together and moving in a fantastic game of catch. Sprint rings are great for ages 7 and up! We LOVED playing with this ring and can't wait to take it to the beach with us for some fun in the sun! Check out this video to see how much fun this ring is!! One Mommy's Moments reader will win one Aerobie Sprint Ring!! 18+ Open to USA only. Ends June 7th 11:59 p.m. Winner will be drawn randomly. All entries must be logged on separate comments to count. LIKE Aerobie on Facebook and tell them that Mommy's Moments sent you by!! I received the Aerobie Sprint Ring for review purposes only. I was not compensated in any other way. I LIKE Aerobie on Facebook and told them that Mommy's Moments sent me by!! I like Aerobie on Facebook - Janet Fri and I left the message that you sent me. I "like" Aerobie on facebook and told them Mommy's Moments sent me. I follow Mommy's Moments blog via GFC. And I told them that you sent me. I like Aerobie on fb! I follow mm via email! I follow mm via gfc! I follow mm via twitter! I follow mm via fb! I like Aerobie on FB (Sarah Smile). I like Aerobie on FB and said you sent me. I LIKE Aerobie on Facebook and told them that Mommy's Moments sent me by! I follow @mommysmoments on Twitter.